The unstoppable rise of veganism – how a fringe movement went mainstream, – reads the headline of the Guardian newspaper in April 2018. Veganism is on a major rise world-wide and the days of meat eaters are slowly coming to an end. And indeed, Google confirms the massive rise of veganism world-wide. In 2018, searches in the Veganism category, which comprises vegan-related searches made in any language (e.g. “veganism”, “vegan restaurants”, “vegan rezepte”), surpassed by a wide margin searches made in previous years. The popularity of vegan-related searches was 11% higher than 2017 and 35% higher compared to 2016. We used Google Trends data to compare the popularity of veganism across the world. 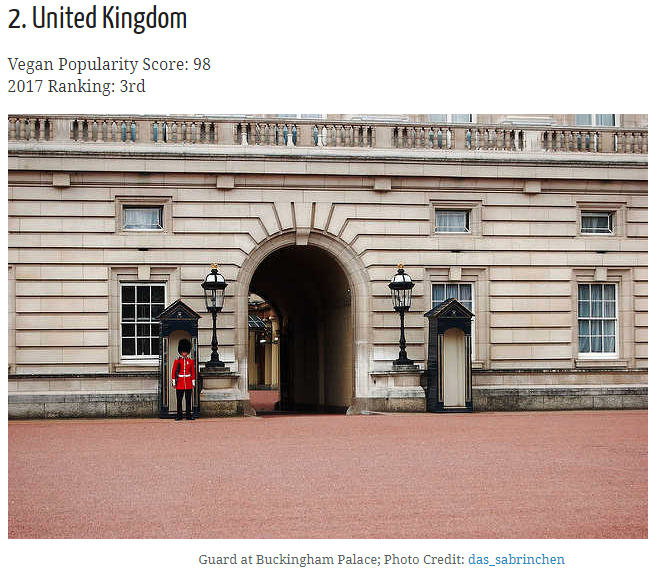 Google assigns a score for each location (broken down by country and city) that shows the interest level of a given topic by comparing searches made for that topic to all Google searches made in that particular location. For example, if Google assigns a 100 score to Australia for veganism searches and a 78 score for the United States, it means that the percentage of Aussies who searched for veganism is much higher than the percentage of Americans searching for the same topic. It doesn’t mean that, in absolute terms, there were more searches for veganism in Australia compared to the US – this would be quite unusual as Australia has a population 10 times smaller than the US. Move over Berlin and London…Bristol is the new European and world-wide vegan capital. 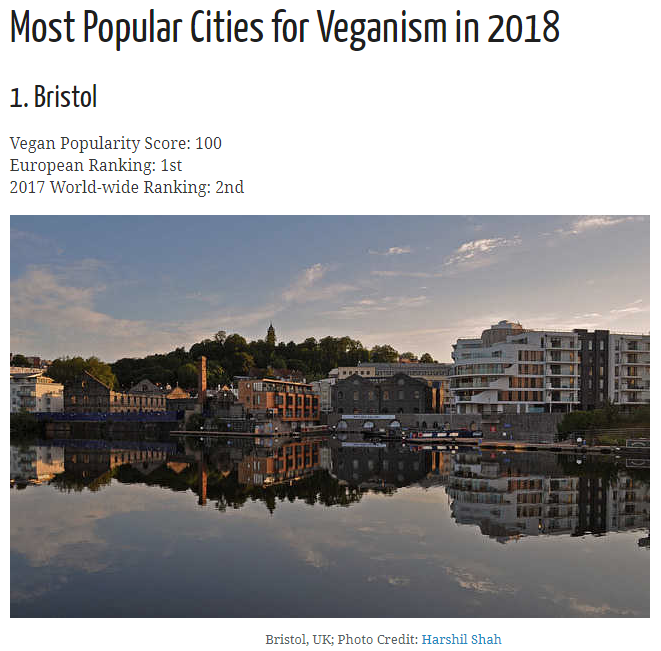 Bristol’s concentration of vegan-related searches on Google surpassed every other city in the world. While this may come as a surprise to many, the locals know all to well that their city has turned into a vegan Mecca. There are lots of vegan restaurants , cafes, vegan hair and beauty saloons and even an active Bristol vegan community. See the full article from chefspencil.com HERE.